Here’s your book for the fall if you’re on global Wall Street. Tobias Carlisle has hit a home run deep over left field. It’s an incredibly smart, dense, 213 pages on how to not lose money in the market. It’s your Autumn smart read. –Tom Keene, Bloomberg’s Editor-At-Large, Bloomberg Surveillance, September 9, 2014. 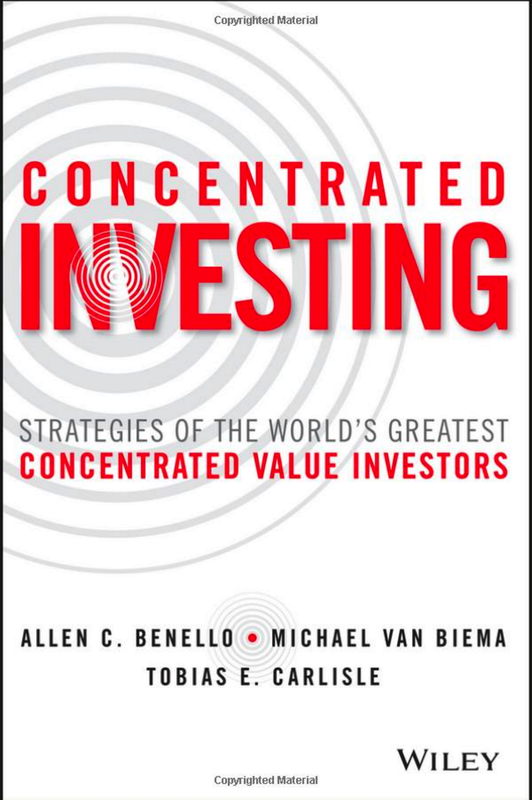 Deep Value: Why Activist Investors and Other Contrarians Battle for Control of Losing Corporations (hardcover, 240 pages, Wiley Finance) is an exploration of the philosophy of deep value investment. It describes the evolution of the various theories of intrinsic value and activist investment from Benjamin Graham to Warren Buffett to Carl Icahn and beyond. Filled with engaging anecdotes, penetrating statistical analysis and meticulous research, the book illustrates the principles and strategies of deep value investing and examines the counterintuitive idea behind its extraordinary performance. The book can be ordered from Wiley Finance, Amazon, or Barnes and Noble. It is a simple, but counterintuitive idea: Under the right conditions, losing stocks—those in crisis, with apparently failing businesses, and uncertain futures—offer unusually favorable investment prospects. This is a philosophy that runs counter to the received wisdom of the market. Many investors believe that a good business and a good investment are the same thing. Many value investors, inspired by Warren Buffett’s example, believe that a good, undervalued business is the best investment. The research offers a contradictory view. Deep Value is an investigation of the evidence, and the conditions under which those losing stocks become asymmetric opportunities, with limited downside, and enormous upside. In pursuit of this idea, it canvases the academic and industry research into theories of intrinsic value, management’s influence on that value, and the impact of attempts to unseat management on both market price and value. The value investment philosophy as first described by Benjamin Graham identified targets by their discount to liquidation value. That approach has proven extremely effective; however, those opportunities have all but disappeared from the modern stock market. To succeed, today’s deep value investors have adapted Graham’s philosophy, embracing its spirit while pushing beyond its confines. In Deep Value, I examine Graham’s 80-year-old intellectual legacy using modern statistical techniques to offer a penetrating and highly original perspective: That losing stocks offer unusually favorable investment prospects. The evidence reveals an axiomatic truth about investing: Investors aren’t rewarded for picking winners; they’re rewarded for uncovering mispricings. Deep Value shows the place to look for mispricings— in calamity, among the unloved, the ignored, the neglected, the shunned, and the feared. Each chapter tells a different story about a characteristic of deep value investing, seeking to demonstrate a genuinely counterintuitive insight.Through these stories, it explores several ideas demonstrating that deeply undervalued stocks provide an enormous tail wind to investors, generating outsized returns whether they are subject to activist attention or not. It begins with former arbitrageur, and option trader Carl Icahn. An avowed Graham-and-Dodd investor, Icahn understood early the advantage of owning equities as apparently appetizing as poison. He took Benjamin Graham’s investment philosophy and used it to pursue deeply undervalued positions where he could control his own destiny. As a portfolio, deeply undervalued companies with the conditions in place for activism offer asymmetric, market-beating returns. Modern activists exploit this property by taking large minority stakes these stocks and then agitating for change. What better platform than a well-publicized proxy fight and tender offer to highlight mismanagement and underexploited intrinsic value, and induce either a voluntary restructuring or takeover by a bigger player in the same industry? We’ll also see how activist investing can be understood as a form of arbitrage. Activists invest in poorly performing, undervalued firms with underexploited intrinsic value. By remedying the deficiency, or moving the company’s intrinsic value closer to its full potential, and eliminating the market price discount in the process, they capture a premium that represents both the improvement in the intrinsic value, and the removal of the market price discount. We scrutinize the returns to activism to determine the extent to which they are due to an improvement in intrinsic value, or simply the returns to picking deeply undervalued stocks. Deep Value is also a practical guide that reveals little-known valuation metrics that activist investors and other contrarians use to identify attractive, asymmetric investment opportunities with limited downside and enormous upside—undervaluation, large cash holdings, and low payout ratios. These metrics favor companies with so-called lazy balance sheets and hidden or unfulfilled potential due to inappropriate capitalization. Activists target these undervalued, cash-rich companies, seeking to improve the intrinsic value and close the market price discount by reducing excess cash through increased payout ratios. We analyze the returns to these metrics, and apply them to two real world examples of activism. The power of these metrics is that they identify good candidates for activist attention, and if no activist emerges to improve the unexploited intrinsic value, other corrective forces act on the market price to generate excellent returns in the meantime. I highly recommend Deep Value. It takes a lively look at a variety of value investing strategies starting with the father of security analysis, Ben Graham. It outlines how individual investors can vastly outperform simple index strategies. For these value strategies to work, investors must be patient and brave, as it requires looking at stocks that the herd ignores. It will be a useful addition to any value investor’s library. Value investing is the most intuitive form of investing ever devised—the attempt to buy one dollar’s worth of assets for sixty cents. In his new book, Carlisle provides a thoroughly contemporary guide to the discipline, informed by killer anecdotes. Deep Value is part historical saga, part treasure map—a must-read for all investors. Deep Value is a smart, modern take on classic Benjamin Graham-style value investment. It’s half history book and half quant stock screen guidebook. Learn both the history of value investing as well as a practical way to put it to work. Deep Value is a refreshing, and highly entertaining work that makes a persuasive case for traditional value investment and a revival of Graham-style ‘ownership consciousness’. It is a compelling addition to the value investing canon. In Deep Value Carlisle provides a qualitative and quantitative view of why value investing has worked since the time of its conception. The book is a unique combination of careful description of the value styles and players, backed up by data that supports the conclusions reached. I strongly recommend this book to the value aficionado. Carlisle has written an engaging history of the market, and its influence on the evolving theory of value investment. He has produced a valuable addition to any value investor’s library. I’m glad I read it. Carlisle’s work succeeds on two levels: It is both a gripping account of some of the most notable episodes in the history of shareholder activism as well as an instructive guide to profiting from mean reversion and activist opportunities in today’s market. Highly recommended! From accounts of bold corporate raiders, behavioral psychology, to hard quantitative research, Deep Value leaves no stone unturned in a passionate exploration of what makes value investing and activism work. Carlisle weaves together a rich tapestry of multi-disciplinary academic research, investment theory, and historical anecdotes to produce the must-read investment book of 2014. Carlisle rigorously shows why value investing will continue to work. Deep Value is a MUST-READ for value investors. Carlisle has persuasively rendered a thought-provoking examination of a counterintuitive investment theory. The book is as engrossing as it is useful. Carlisle’s book provides a wonderful combination of entertaining case studies, synthesized with results from academic research and statistical backtesting, to arrive at sometimes surprising conclusions about what works in investing, and why. Order the book from Wiley Finance, Amazon, or Barnes and Noble. @Emory_R @Greenbackd #DeepValue Read it. Loved it. Intend to review it regularly — excellent resource! Buy it!!! @Greenbackd @trengriffin @JimBowerman1 @pmarca Love your new book Tobias. 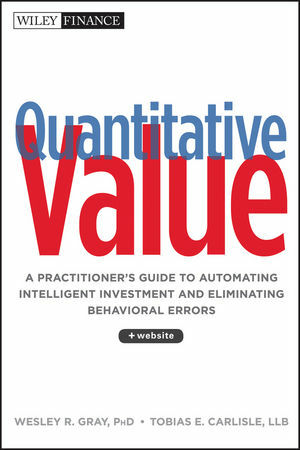 Just finished Quantitative Value and Deep Value by @Greenbackd. Quite theoretical and quant-y but superb reads! I highly recommend @Greenbackd's new book "Deep value" for all value investors. Simply great stuff! @Greenbackd cca. in the middle of Deep Value right now, Tobias. Another great piece of yours. Happy to have received my copy of Deep Value by @Greenbackd – great weekend reading! @Greenbackd just downloaded your book and finished reading the preface! Getting excited!! @Greenbackd buying your book today!!!! @Greenbackd on Reddit http://t.co/zZ6mhsmbYt So good I'll have to come back & read it again…twice! @millennial_inv @timmelvin @Greenbackd OK, I just bought it…on a tip! Have been "looking inside the book" – joins #readinglist MT @jposhaughnessy read an advance copy of @Greenbackd great new book. Also read an advance copy of @Greenbackd great new book. I highly recommend you buy and read it! @Greenbackd I will write an Amazon review for you. As a deep value guy, your book speaks to me. Loved it even more than the first one. @Greenbackd I am reading your new book. It's awesome. Deep Value is a most worthwhile read. Having worked most of my working life in Australia with Ron Brierley and subsequently as an analyst in Canada focused on value oriented investing, I believe that Tobias has produced an excellent assessment of the investment analysis methodology used by some of the finest minds, supported it with quantitative data and highlighted the proven record of using enterprise value and EBIT.